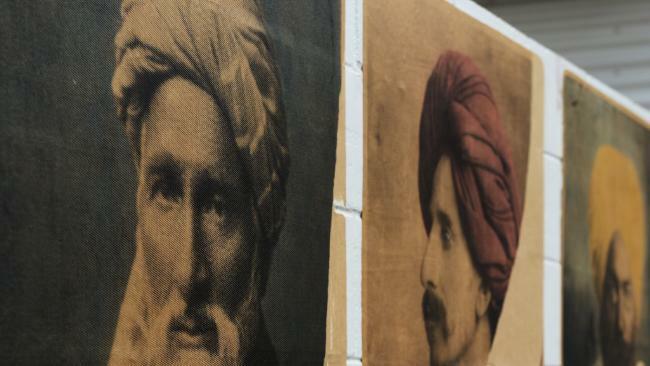 Street artist Peter Drew is taking his politically charged artwork to the US. IT'S much easier to be controversial online. When you take a divisive message into the street, it presents a far more unpredictable set of variables. Especially when your message is about gun control and your audience is America. Acclaimed Australian street artist Peter Drew is about to tackle the hottest issue in the US in his own unique way - by plastering 500 posters with the words "Australia" and "it works" on walls around New York City, San Francisco and Los Angeles. The South Australian-based artist behind the Real Australians Say Welcome campaign knows that by doing so he'll make a lot of people unhappy. And that's part of the job. 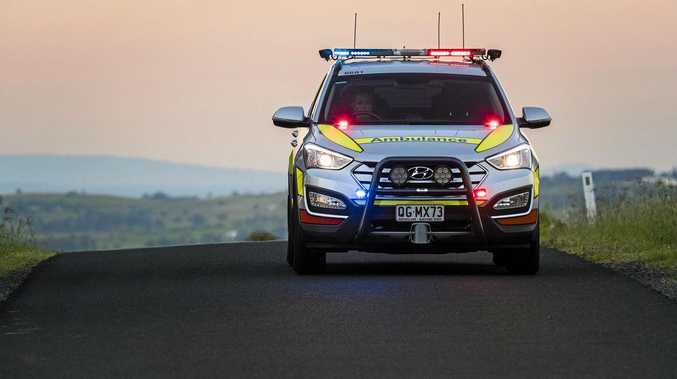 "To be honest, there's a certain amount of fear and anxiety," Mr Drew told news.com.au. "You don't know what the response is going to be like. Online it's safe to be provocative but when you're sticking stuff up on the street you're exposed. I worry about that but that's what's special about the street." Peter Drew is taking his posters to the US. Mr Drew has never done anything on this scale before. He'll head off in August and take to the street in major cities early in the morning - as early as 4am - when foot traffic is at a minimum. It will be first of two trips to explain to Americans that their attachment to guns can be broken. He says there's never been a better time than right now and there's no example better than Australia's. "The aim isn't to tell people what's right and wrong, it's to satisfy both sides and try to find some middle ground. I try to lampoon the outrage industry which is particularly strong in the US and we can see that culture bleeding right now ... I feel like the conservative resolve is eroding. "It's so incredibly complex but I think the example of Australia can play a role." 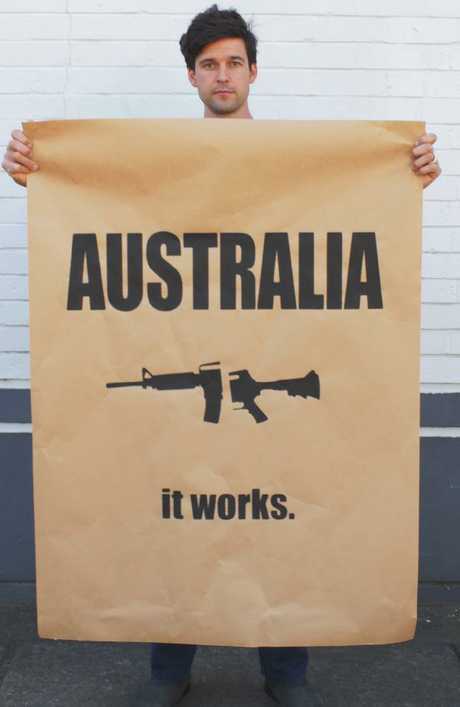 The posters reference Australia's uniform gun laws, introduced by the Howard Government following the Port Arthur massacre in 1996. The laws are viewed around the world as an example of what works, but large sections of America reject the notion of gun control, pointing to their right to bear arms within the US Constitution. Calls for change are growing louder after a deadly start to 2018 that included the massacre of 17 people at a high school in Parkland, Florida. Mr Drew says any discussion on the subject is a good one. It's the first time Mr Drew has tackled gun control after focusing on multiculturalism and acceptance of refugees and asylum seekers. 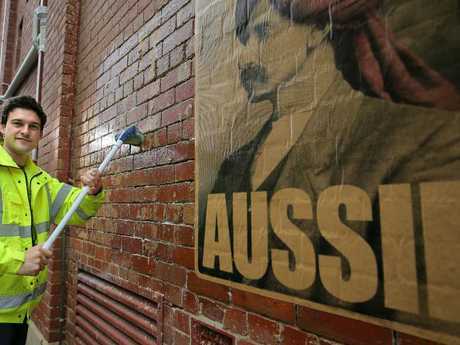 In 2015, he dropped 1000 posters that read simply, "Real Australians Say Welcome". That was followed by the "Aussie" posters featuring the face of Monga Khan. To support him, visit peterdrewarts.com.